I was helping someone work in their yard and I had forgotten my own shovel so I reached over and grabbed her shovel to dig up a shrub that needed to be moved. The shrub just happened to be on top of a root from the massive Oak about 25 feet away and I did not realize this until I try to lift the shrub out of the hole and it would not budge. I thought to myself “I dug all the way around and it moved as I lifted up the edges so what in the hell?” So being the impatient woman I am, I pushed the shovel under the bush and pushed down on the handle to lift the plant out. It would not move so I pushed with all my might and CRACK the handle broke and I went face first into the bush. My good friend, Marie, came over and said “Oh my goodness, are you alright?” I said “yes but my pride isn’t” She laughed and said “you owe me $5 for the shovel”. I jokingly said “really, where did you buy this crappy shovel -at Walmart?” “YES” as she laughed at me some more. The moral of the story? Do not scrimp on buying a good shovel. 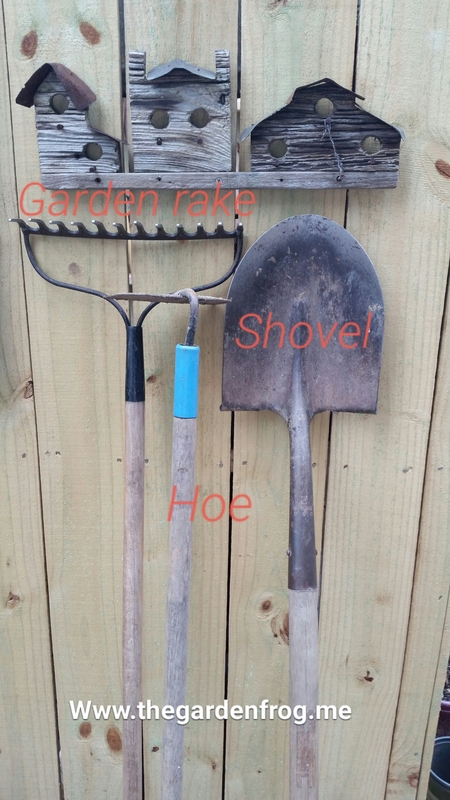 Now the other 2 must have garden tools to begin are the garden rake and the hoe. A garden rake is used to smooth out dirt and sift through rocks in newly worked beds. A garden rake is also good for raking dead grass out of your lawn. 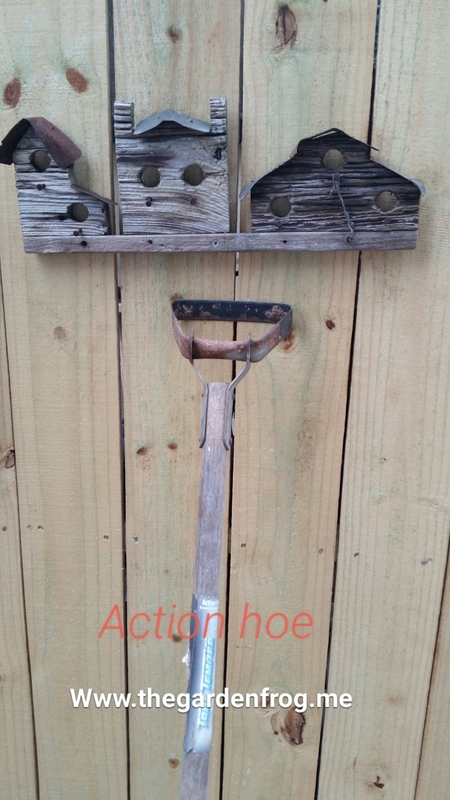 The hoe is needed for weeding and breaking up dirt clods in the garden. The next purchase are hand tools such as hand pruners, loppers, and a garden trowel (small shovel). The garden trowels can be found cheap but beware they will not take much abuse. Later on buy a good quality small hand trowel for planting small plants and a large trowel for scooping out potting soil. 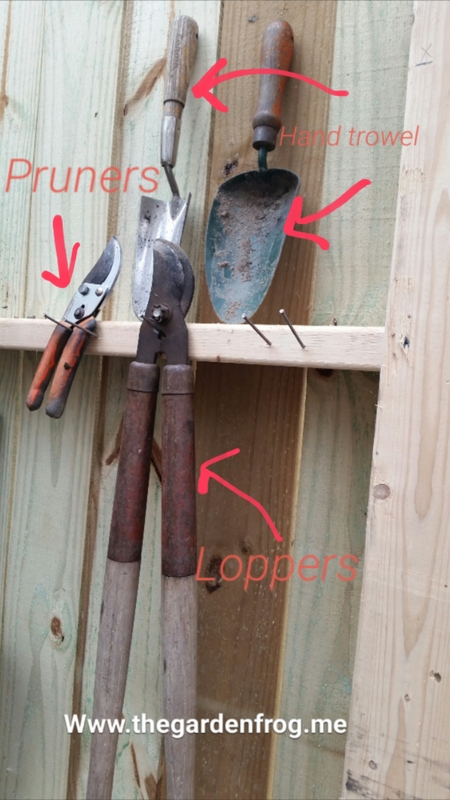 Loppers and pruners are an investment. You do not to spend your whole paycheck but you do need to watch the brand and warranty. You need to invest in a good leaf rake! 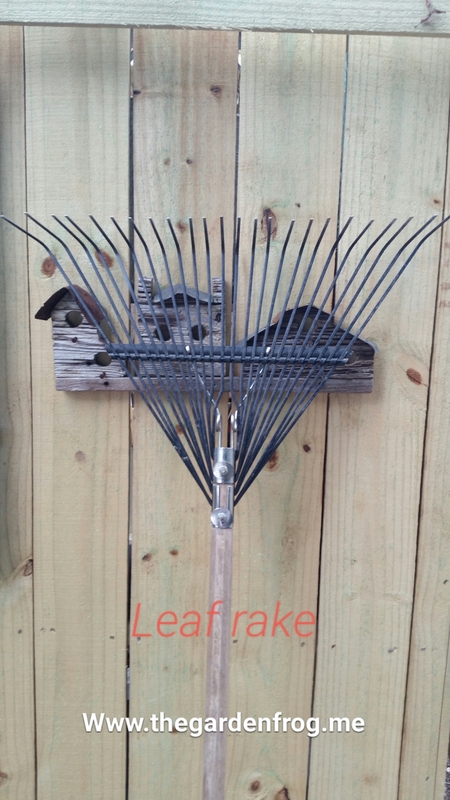 I spent the $20 at Sears for this wire leaf rake because it is gentler on the plants when raking the leaves. Plus I just like the way it handles. There are hard plastic ones which are inexpensive and they work great too. 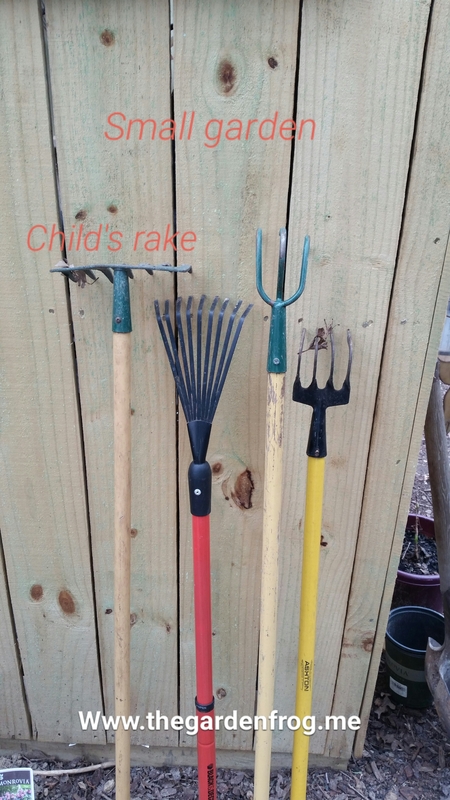 You are going to be on the look out for children’s garden rakes and hoes. I love using the small garden rake around my plants. Small leaf rakes are great for getting leaves around bushes and perennials. 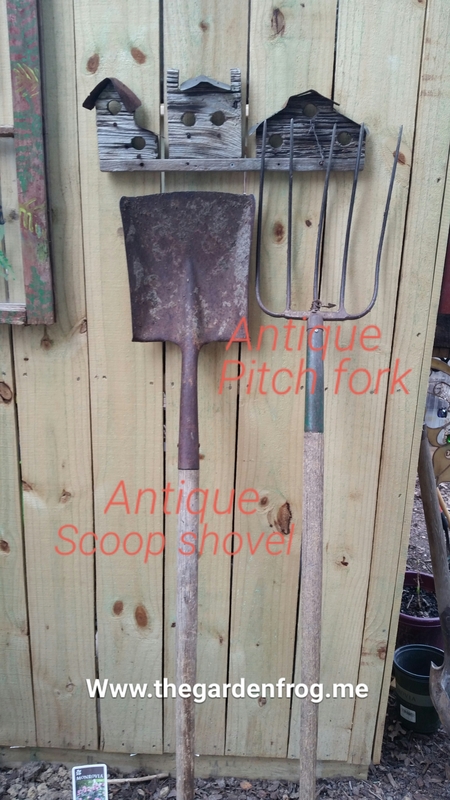 Another pair of garden tools to watch for are a scoop shovel and a pitch fork. You need a scoop shovel if you are going to unload gravel or dirt off a truck. Scoop shovel is also good to use as a ‘dust’ pan for the driveway. A pitch fork is great for mulch and moving leaves in big piles. If are going to dig a lot of deep holes, then I suggest a spade. I have had this one for about 15 years and it has been left out in the rain and I have never done what I hear you are supposed to do for your garden tools- wash them, oil them, and put them away in a bucket of sand (or some other advice for them not to rust). Well, as you can see 15 years of ‘neglect’ and it is still my go to for digging deep holes. 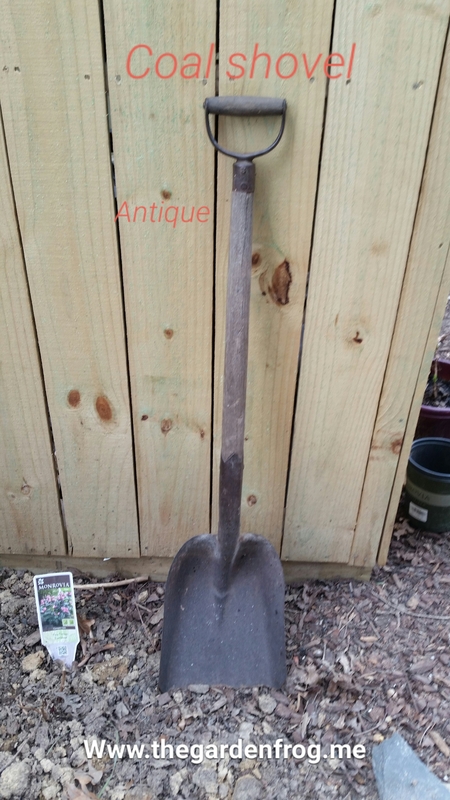 My favorite and most sentimental garden tool is my antique coal shovel. I bought this about 20+ years ago at an auction and it was the best $2 I ever spent! 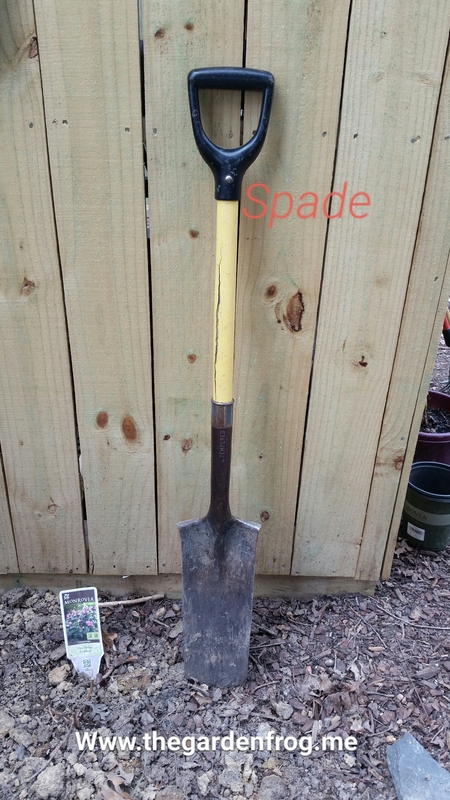 It is short and has a small handle which is perfect for scooping out rock and dirt from a truck (this is not a man shovel LOL). It works great to scoop out dirt from my wheelbarrow too. It is the perfect size. You are probably wondering why you would use such a funny looking garden tool. Well, I thought the same thing for years (plus I had someone tell me it was a useless hoe) but I am here to tell you that it is a great thing to have. I use it to scrape acorns out of the garden bed that have sprouted because you gently drag or push it across the ground snapping off the sprouted acorns. It also works great after a rain to scrape off weeds such as creeping charley. I found this at a garage sale for a $1! 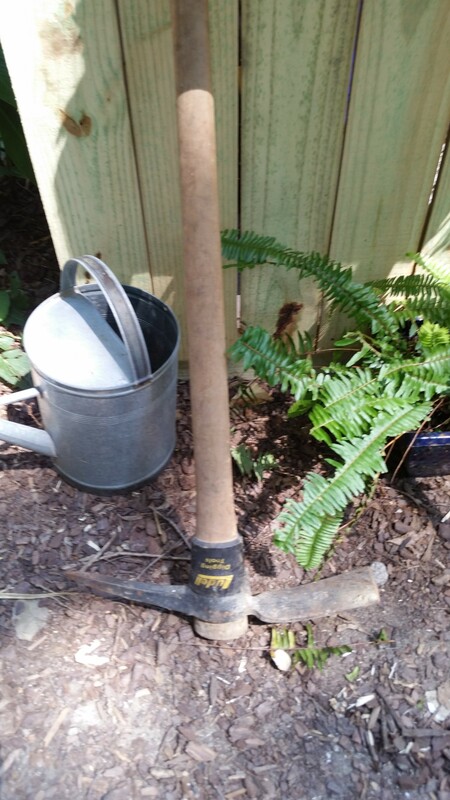 If you are going to dig in rocky soil, hard clay, or dig up tree roots then invest in a pick ax! 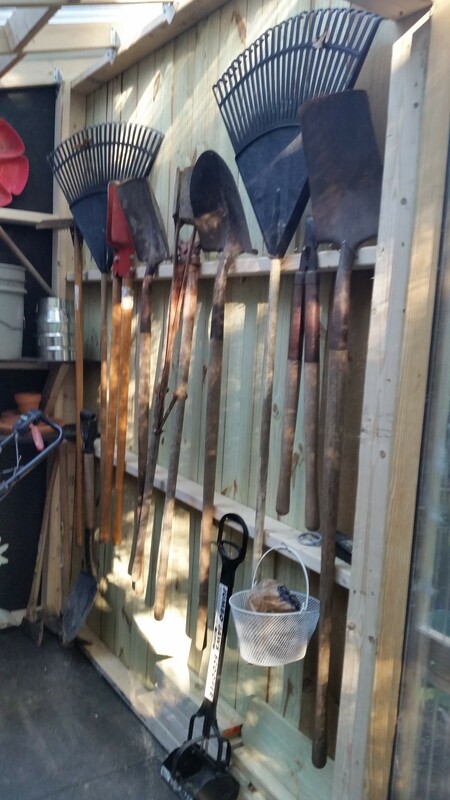 There are many other tools to buy as you become more familiar with gardening but start out with the ones I have written about here and you will do just fine. Buy more tools as your budget allows or if you are lucky enough to find then at garage sales, auctions, or even on clearance! Oh cannot forget to tell you about garden gloves! 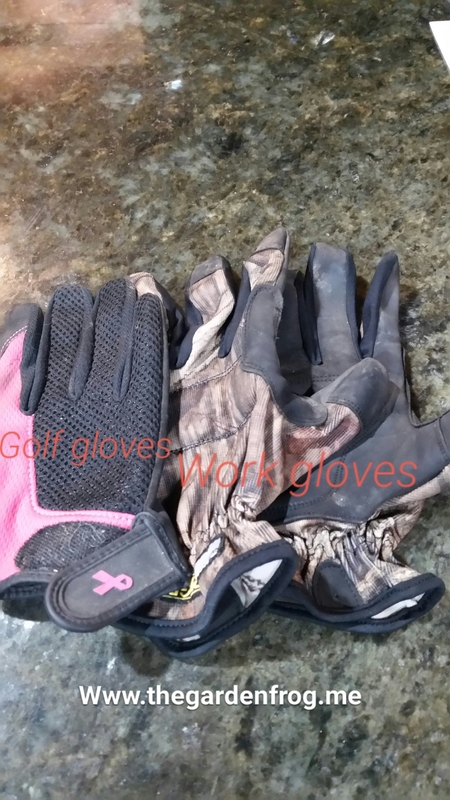 I do not restrict myself to gardening gloves either- mechanic, athletic, or snug fitting gloves works great if you are going to do a lot of raking or digging. 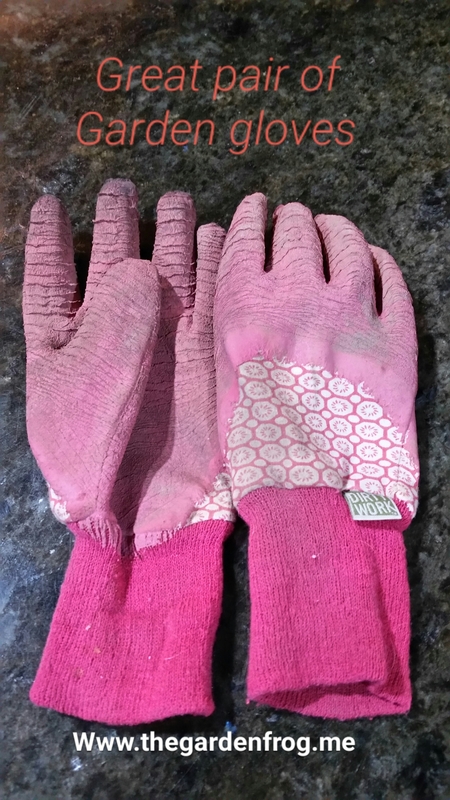 If you are working in a lot of dirt get good garden gloves with rubber/latex fingers. Hint: gloves are washable but do not dry! Creating. Inspiring. Gardening without the rules! 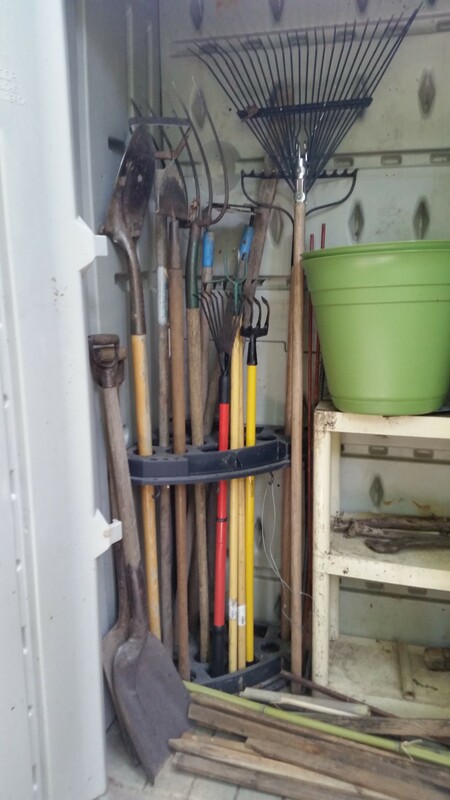 Thanks to this post i really like this post its tools is very useful for gardening. and Tree cutting or pruning. if you want any tree related tools to contact with American Tree Services Supply. I too think that the essential 6 tools to have in your yard are the: shovel, rake, hoe, hand shovel, shrub rake/leaf rake, and pickaxes. I am an avid gardener and think that buying tools for the yard accumulates slowly. The expense of a yard doesn’t need to be expensive, but there are those things that you really must spend more on any one of them, I would suggest the shrub rake since they often break easily and can be used for more than one thing. I will have to purchase a pitch fork since it is a very tool I don’t have.